So pretty. I loved Payal Luthra’s previous collection (read my post: The Architect’s Cashmere) for Fall/Winter 2010 and it is so nice to see her warmer weather creations. This time around the fine cashmere she uses makes her scarves, shawls and cowels looks light as air. 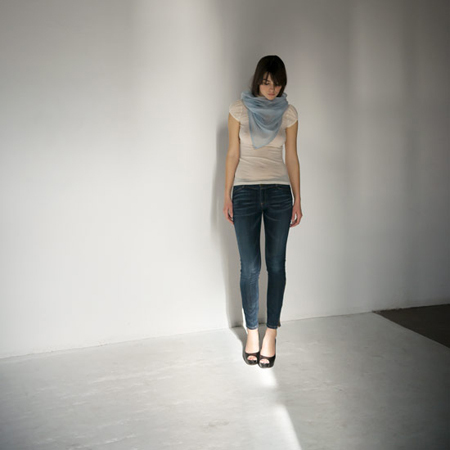 Her new Ring Scarves with the grosgrain ribbon detail are so lovely–I’d love to have one in heather tan. With spring, Payal has also added cashmere shrugs and cropped gilets to her line. Beautiful. There is a lot more to see in her Spring/Summer 2011 lookbook and in the shop. damn girl, your blog is going to make me go broke! ;) I love that first scarf with the contrast trim. ungggh! That is my goal! Hahaaa… I’m glad you love them too, Melissa! Aren’t they beautiful? Payal is fantastic.